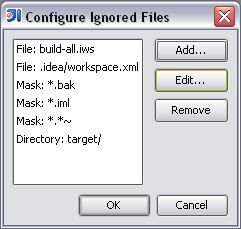 In the changes tab, there is a dialog to add some files/pattersn/masks to be ignored from the vcs. I'm wondering how this is supposed to be used from the openAPI ChangeProvider ? I have a multi module maven project. - the target directory, and any files under it. I've tried using directory or using masks but can't get it right. Has anyone managed to ignore directories using the vcs ignored dialog ? Any clue for solving this ? Each of those modules have eclipse project files (.classpath, .project for example) at their root which have been committed in the VCS , and also a maven target repository. I want to ignore both of these, how should you set this in the VCS ignored files dialog ? also a maven target repository.